Archives are not to be confused with libraries! The documents from Murrabba’at were not found by archaeologists in situ. Legal documents, letters and lists, whether written on papyrus or potsherds, irrespective of date and location, came to the museum with no contextual data attached to the finds other than potential cave numbers (deduced by the archaeologists later). However, most of the documents from Nahal Hever were in fact extracted from the caves in controlled excavations by Yigael Yadin and his team. The Babatha archive was contained within a leather pouch. The Bar Kochba letters were concealed separately within a waterskin. The En Gedi archive was found alone and separate. (Also the Biblical scrolls were found in a separate location in the cave, apparently separate from the documentary and archival material.) These are archives which were taken from their original storage containers from homes or community archives and transported in lighter leather pouches. Fabric pouches may also have been used to transport other collections of documents but have not survived. Most archives from Egypt were not obtained by controlled excavations. 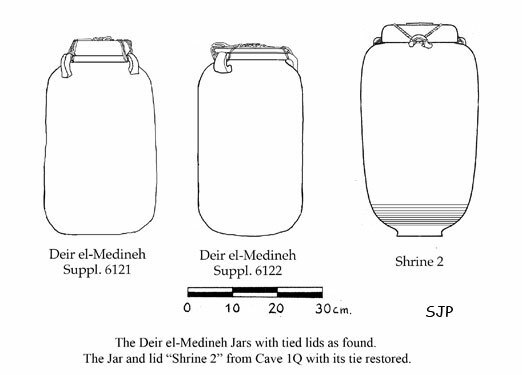 Happily, archives were found during the excavations of Deir el-Medineh in Egypt stored in two sealed jars. Private archival documents, including deeds, marriage licenses, promissory notes, receipts and private letters are not normally stored on library shelves where access is intentionally more open. Not today, nor in antiquity. Archives are intentionally sequestered with their access sealed or limited to those who are privileged to do so. They are often sealed in jars or safes secured in a room, a cave or buried in a floor. In the most secure conditions, the archive jars are tied and sealed and the documents inside are also individually sealed with five or seven seal impressions and/or signatures. The fact that archival documents are not common among the libraries of Qumran may have several explanations. The best explanation is that private documents, not likely a target for thieves, were kept close to the individual refugee. The expensive institutional libraries, susceptible to robbery, were stored safely with the hope that the fleeing community that hid them will one day return to retrieve them. In the case of the Bar Kokhba caves of Nahal Hever and W. Murabba’at a different story has been told. The various caves were inhabited by families of refugees from the districts under various commanders who were assigned to each cave. After a period of time, the Romans built seige camps above the caves and eventually captured or killed the refugees. If the refugees were able to escape they would likely have carried their archives with them. Cotton, Hannah M. “Subscriptions and Signatures in the Papyri from the Judaean Desert: The Cheirochrestes.” Juristic Papyrology 25 (1995) 29-40. Cotton, Hannah M. “The Languages of the Legal and Administrative Documents from the Judaean Desert.” Zeitschrift für Papyrologie und Epigraphik 125 (1999) 219-231. Cotton, Hannah M. “Documentary Texts,” “Hever, Nahal: Written Material,” “Se’elim, Nahal: Written Material,” In Encyclopedia of the Dead Sea Scrolls, ed. Lawrence H. Schiffman and James C. VanderKam, 1-2:212-215, 324-326, 359-361, 474-475, 860-861, 984-987. 2 vols. New York: Oxford University Press, 2000. Cotton, Hannah M. “The Bar Kokhba Revolt and the Documents from the Judaean Desert: Nabataean Participation in the Revolt (P. Yadin 52).” In The Bar Kokhba War Reconsidered: New Perspectives on the Second Jewish Revolt against Rome, ed. Peter Schäfer, 133-152. Tübingen: Mohr Siebeck, 2003. Cotton, Hannah M., W. E. H. Cockle, and Fergus G. B. Millar. “The Papyrology of the Roman Near East: A Survey.” Journal of Roman Studies 85 (1995) 214-235. Cotton, Hannah M. and Joseph Geiger. “The Economic Importance of Herod’s Masada: The Evidence of the Jar Inscriptions.” In Judaea and the Greco-Roman World in the Time of Herod in Light of Archaeological Evidence, ed. Klaus Fittschen and Gideon Foerster, 163-170. Göttingen: Vandenhoeck & Ruprecht, 1996. Cotton, Hannah M. and Joseph Geiger. “Herod and Masada: The Written Finds.” In The Story of Masada: Discoveries from the Excavations, ed. Gila Hurvitz, 77-83. Provo, Utah: BYU Studies, 1997. Cotton, Hannah M. and Ada Yardeni. Aramaic, Hebrew and Greek Documentary Texts from Nahal Hever and Other Sites: With an Appendix Containing Alleged Qumran Texts. DJD 27. Oxford: Clarendon, 1997.
collaboration with Emanuel Tov). Brill/IDC, 1993. S. Pfann, ‘Kelei Dema‘: Scroll Jars, Tithe Jars and Cookie Jars,’ Copper Scroll Studies: Proceedings of the Manchester Copper Scroll Conference, edited by George J. Brooke and Phillip R. Davies. JSP Supp. Sheffield Academic Press (2002).